With North Korea in World Spotlight, What Can China Do? The UN Security Council will add the issue of human rights in North Korea to its agenda. In late November 2014, the United Nations General Assembly’s human rights committee (HRC) voted for the first time to request that the U.N. Security Council refer North Korea’s leadership to the International Criminal Court for prosecution over the country’s poor human rights record. The vote calling for an ICC referral followed a February 2014 report by a UN Commission of Inquiry detailing the extent of human rights abuses and atrocities in North Korea. Following up on that U.N. vote — which passed with 111 member states in favor, 19 against, and 55 abstaining — 10 of the U.N. security council’s 15 members have signed a letter drafted by Australia, a non-permanent member, asking for the council to be briefed on the human rights situation in North Korea by U.N. officials. The countries that signed Australia’s letter include Chile, France, Jordan, Lithuania, Luxembourg, South Korea, Rwanda, Britain and the United States. Notably, North Korea’s closest benefactor, China, did not sign the letter. Russia, which has been expanding its diplomacy with Pyongyang in recent years, also refrained from supporting the move. 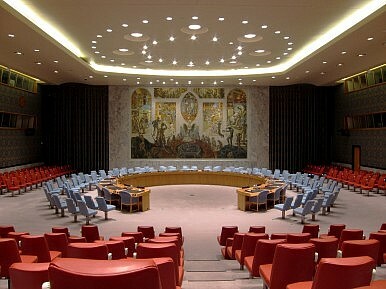 While neither Russia nor China as permanent members can prevent an item from being added to the council’s agenda, they can ultimately veto any Security Council vote to refer North Korea’s case to the International Criminal Court. In addition to China and Russia, Argentina, Chad, and Nigeria did not sign the letter. The North Korean mission to the United Nations has not commented on Australia’s draft letter so far. While China remains one of North Korea’s closest partners on the international stage, the relationship between Pyongyang and Beijing has grown increasingly contentious during Kim Jong-un’s tenure as North Korea’s leader. Late last year, Kim Jong-un executed Jang Song-thaek, the man who was the regime’s second-in-command and considered Pyongyang’s top liaison to China. In spring 2014, reports emerged that North Korean propaganda had started to condemn China, calling it a “turncoat and our enemy.” Shortly after those reports came out of North Korea, editorials in China’s state-run newspapers began criticizing North Korea. Further signaling growing distance between Beijing and Pyongyang, North Korea has expanded its diplomatic interactions with other countries including Japan, Russia, and even the United States to an extent. While Pyongyang is hardly looking to find a substitute for China, which remains an important economic and strategic partner on paper, it is looking to hedge against complete abandonment. Experts have further speculated that part of Pyongyang’s recent “charm offensive” is motivated by a desire to avoid an embarrassing referral to the International Criminal Court for its leadership. Should the issue of North Korea’s human rights record find its way onto the Security Council’s agenda, China will be in a tough spot. All expectations are that Beijing and Moscow will veto any resolution calling for an ICC referral. However, doing so would be embarrassing for Beijing, which increasingly seeks to be taken seriously as a responsible great power. While Beijing would justify its vote on the basis of denying outside interference in North Korea’s domestic affairs, it would nonetheless appear that China effectively condones North Korean atrocities. Given the growing distance between Pyongyang and Beijing, the costs of unequivocally supporting North Korea on the international stage might start to look less attractive to Beijing. It might indeed be time for Beijing to “abandon” North Korea. With two-thirds support, the issue of human rights in North Korea will find itself on the agenda of U.N. Security Council. Additionally, the 193 members of the UN General Assembly will formally approve the HRC resolution later this month. While an ICC referral is uncertain, what is certain is that North Korea’s human rights situation will be on the top of the global agenda over the next few weeks. Is China Finally Fed Up With Kim Jong-un’s North Korea? What explains Beijing’s acquiescence to unprecedented sanctions at the UN Security Council?